It feels like I'm meeting myself coming through the door. While some aspects of what I do have changed in the 14 years I've done it, some things, such as hands on customer service have not changed. This year, starting in January, there's been more hands on required. My boss said it's like there's this pent up demand for all things building. The recession hit Chicagoland, but not as badly as it did other places. I don't know why, but we managed to weather the downturn decently. It wasn't easy, but we did it. Now, we find ourselves with phone call after phone call asking for our hands on services. It's meant a lot of time in the car for everyone, even me. Last month I went to Iowa and Wisconsin. This month, it's so far just been around Chicagoland, but there is the potential for another trip overnight somewhere to provide services. I tend to eat better if I am forced to find lunch rather than scrounge the inner shelves of the fridge. I've been so tired at night that supper tends toward cereal or a peanut butter sandwich, neither of which produce leftovers. Yet, I know where there are really good salads and I rarely eat hamburgers on the road. The offerings around the office are very good and lunch can be the best meal of the day for me, unless it's 11:45 and I'm in the city and heading back to the office. Such was my dilemma on Friday. I was in the city. It was a gorgeous day to be in the city, even if I was working. 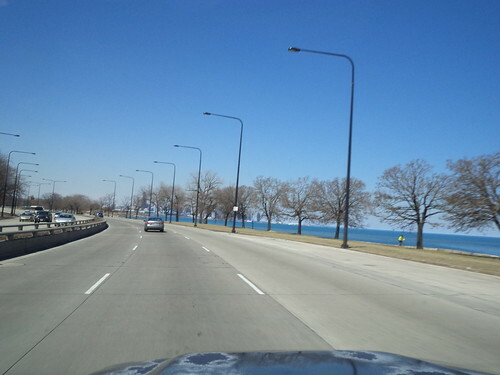 The 98% ice on Lake Michigan is gone, thankfully. The sky was clear and there was a wind out of the south, carrying the warmth from the Gulf of Mexico all the way to the shores of the Great Lakes. I had hoped to stop and take photos of this spring beauty but I had to get back to the office. There was no time to gawk, no time to marvel, no time to sit and be. I needed gas, but in the city, there is no such thing as "cheap" gas. In the last two days, I've seen prices climb 20 cents and I'm not sure why. I probably could have made it back to the office, but why chance it. 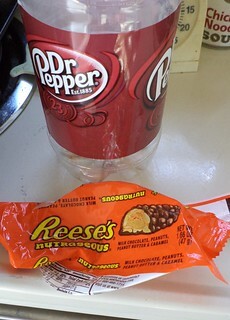 There was a station next to the job I was at so I put a bit in the car and got myself a soda and a candy bar. There would be no time for lunch today. I had work to finish on deadline. I had to be back. And, as tired as I was, the caffeine and sugar in these products would keep me going just enough to get home and a ham and cheese sandwich and sliced fruit. Actually, I just needed a bit to take the edge off, so to speak. It was so wonderful out that I didn't notice I was hungry until I got home and collapsed in a heap in the recliner. Some days, soda and a candy bar are it. That can be all you have time for. Yesterday, I probably could have gone without and just lived off the day. Thank you for your comforting words about Grammie ( Mom).